Last year when I started making sketchbooks, I’ll be honest, I was really only making them for myself. I loved going to a coffee shop or bar and passing the time people watching and doodling; a sketchbook made out of a craft beer box is a perfect fit. It wasn’t until I started make them for a friends that I thought the idea could turn into something…but never custom menus! Fast forward six months to the first craft fair I did (Jackalope Phoenix, always a good time, by the way). While there, I spoke with people who liked the beer box idea but wanted lined notebook paper. I started to warm up to the idea of exploring other types of books. Sure, I’m into drawing, but a lot of people aren’t. Lined notebook paper makes perfect sense. After the notebooks, I started doing smaller, pocket versions, one of which I always have on me anyway, I don’t know why I didn’t think of it sooner. Beer tasting books came next, and now, just in time to be a stocking stuffer for Christmas, pocket-sized beer tasting notebooks. This summer, I was contacted over Instagram with an interesting idea by a local beer guy extraordinaire, who just happens to be the manager of a steakhouse at one of the higher end resorts in North Scottsdale. He wanted to explore the idea of doing a custom menus for their bar in the style…the wheels are turning now! At the time, the existing restaurant was a steakhouse, but was going to change focus and reopen as a gastropub, with an extensive craft beer list and locally-designed custom cocktails and food. The beer box idea was going to be a great match to the concept. The rotating tap list has over 75 different craft beers and ciders from around the country, but we wanted to highlight Arizona breweries, and feature as many local boxes as possible. I put an appeal out on social media, and Mother Road Brewing, Four Peaks, and Dragoon all came through in a big way. I keep saying, beer people are the coolest people! 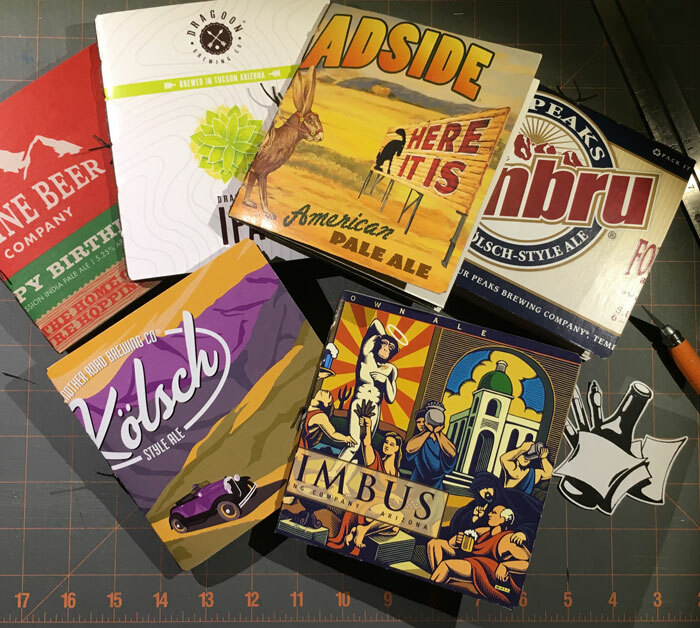 Creating a menu out of a beer box seems like an easy enough task, but the size of the boxes quickly became the largest challenge. Most six-pack boxes have no panels larger than 6 inches tall by 8 inches wide. Unless we wanted to wrap the menu in the box sideways, we were limited to a shorter form factor. Knowing that was the challenge going in, everything else was easy! A dozen hi-fi mockups (and many more concepts that never saw daylight) later, we ended up with our first collection. The first pass of hand-stitched custom menus, all crafted from the boxes from nine breweries on the tap list. Of the nine, four of which are in Arizona, with more in the works for the next go round!